An entire regiment of soldiers of Irish Catholic origin fighting for the British Crown was quite an unusual situation in the British Atlantic World at the end of the eighteenth century, but two such a groups were created in the colonies of Pennsylvania and New York during the American Revolution. Irish Catholic participation in British military campaigns during this period is particularly intriguing for two reasons. Firstly, instances of Catholics in the British Army during the eighteenth century were rare, as Irish Catholics could not hold firearms or serve in the British armed forces officially until 1793. Secondly, Irish Catholics had little reason to feel supportive of British colonial ventures owing to the imperial policies forced upon them in Ireland. There were, however, two provincial (American loyalist) regiments composed of Irish Catholics during the American Revolution: the unsuccessful Roman Catholic Volunteers and the decorated Volunteers of Ireland. Why would Irish Catholics offer service to the British Crown after a long history of oppression under the English? Each individuals’ reasoning was peculiar to their circumstances, opportunities, and beliefs, but these factors combined to push a significant group toward active participation in the loyalist cause. During most of the American Revolution, Catholics in Ireland lived under the Penal Laws imposed by the British government starting in the early eighteenth century after the conquest of William of Orange. The Penal Laws limited Catholic participation in politics, law, land purchase, military service, and practicing their religion. The religion survived, and a subversive culture of agrarian secret societies arose in response to English oppression, although the middle class Irish involved in trade did try to emphasize their loyalty to the Crown. In 1782, Ireland’s parliament became independent from Britain, allowing some legislative freedom for a time. Catholics were still barred from holding firearms or serving in the British armed forces until the ban was rescinded by the Militia Act of 1793 along with other bans on voting and participation in legal professions. 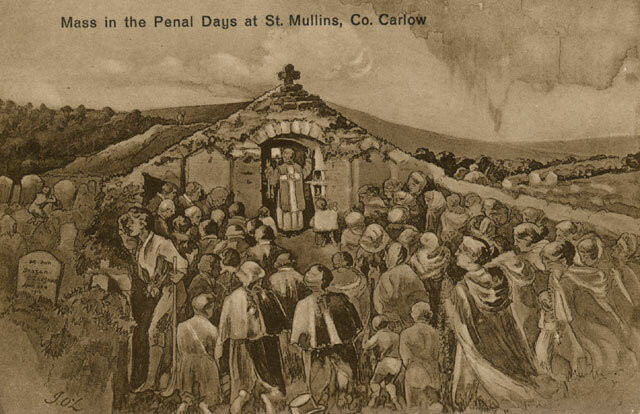 During the eighteenth century, laws were put in place limiting the building of Catholic Church in Ireland, as well as the role of Catholic clergy, often necessitating impromptu liturgical celebrations. Were Irish Catholics in Ireland and America more likely to support the patriots/rebels or the loyalists/tories during American Revolution? On the surface, it might appear that the majority of the Catholic population of Ireland and Irish immigrants in America would be obvious supporters of the American Revolution, with a natural empathy toward the patriots. Many Irish and Americans were looking for government by consent of the people and did not want to be legislated by British Parliament without representation. Ben Franklin and John Adams even linked the two political situations explicitly, but there were important distinctions between Irish nationalists and American revolutionaries, and the situations were not completely analogous. 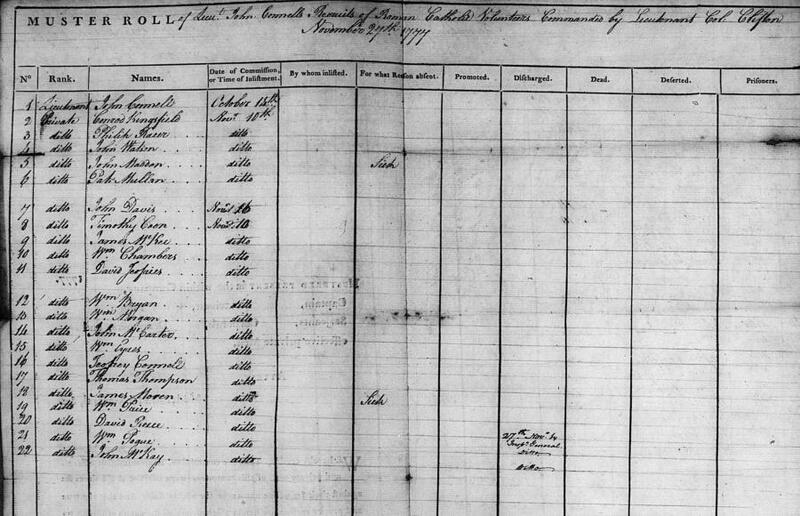 Leading up to the Revolution, a large number of Irish immigrants (many from Northern Ireland) came to America; this migration increased the population of some of the American colonies (particularly Pennsylvania) in the years directly before the outbreak of conflict. The new Irish arrivals had significant representation in the American patriot military, but Irish Catholics were also found on the British provincial regiments during the Revolution. Necessity had prompted the British to draw upon any source available for troops in American. 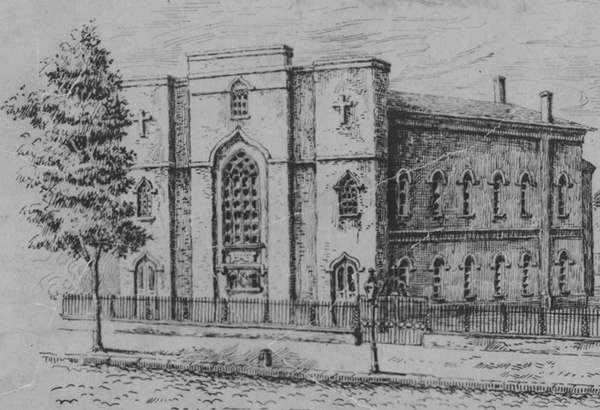 Old St. Mary's Church, which was key to the formation of the Roman Catholic Volunteers in Philadelphia, Pennsylvania. What made the Roman Catholic Volunteers particularly unusual amongst loyalist regiments was that its officers, not just the private soldiers and non-commissioned officers, were Catholic. The decision behind the appointment of Catholic officers was explained the approval document for the regiment, that it was made “on a presumption that they will prefer serving under an Officer to who they are naturally attached . . . do engage none others but of the Roman Catholick community.” The regiment was raised in Philadelphia in October 1777 under Lt. Colonel Alfred Clifton with the aim of drawing on the population of middle class Roman Catholics, who hailed mainly from the local community surrounding St. Mary’s Parish. Approximately two hundred men, fourteen officers, and four companies—which made up the Roman Catholic Volunteers—were sent to New York in 1778, where they guarded the British Army’s baggage but did not see action. Discipline fell apart amongst the ranks, however, with soldiers becoming unruly, plundering and committing acts of violence against civilians during the retreat from the Battle of Monmouth through New Jersey. As a result, only a year after its creation on October 25, 1778, the Roman Catholic Volunteers were disbanded. About eighty members were merged with the Volunteers of Ireland with others being sent to the British Legion. Next post: “Fighting for the Crown? : Irish Catholic Loyalists in the Military, Part 2” where the role of the role of the Volunteers of Ireland in the American Revolution will be explored.